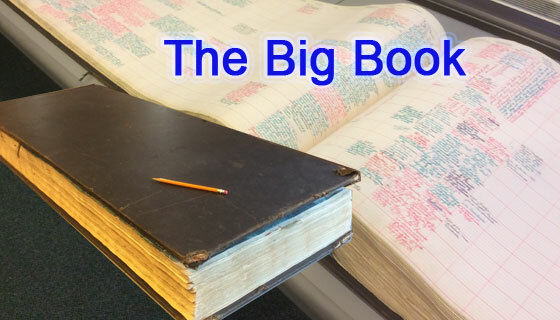 The Big Book (above) is a tome of about 2,000 pages that Dr. Raymond Wheeler created over a ten year period in which he recorded all the major events from 600 BC until about 1940. 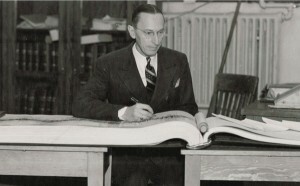 Along with the events, he also recorded the temperature and level of precipitation. He’s come to very strong conclusions about the cycles of our past and how they affect our future. His work on climate has been backed up by the GISP2 data derived from Greenland ice cores much more recently (1990s), so the science is solid. The luminaries that I follow include Ralph Nelson Elliott (of course), Ellsworth Huntington, Edward Dewey, Alexander Chizhevsky, Nikolai Kondratiev, and Dr. Wheeler, amongst others. Working independently in the early 20th century, they all came to the same conclusions: Everything on Earth is influenced by cycles, created by exogenous forces. Here’s a snippet of Dr. Wheeler’s writings, which first appeared in the Journal of Human Ecology, in 1951. “Every second 500-year period in history belongs to Western Civilization. Every intervening 500-year period belongs to Eastern Civilization. Europe and North America have dominated a 500-year period just now ending. The next 500 years of history will belong to Asia. At the end of each 500-year cycle, but more especially at the end of every other 500-year cycle, major revolutions occur over the whole world that result in drastic reorganizations of society. One feature of these revolutions is a sudden spurt in the growth of democratic institutions. We are in a revolution of this sort now, comparable to the collapse of medieval culture and the beginning of the modem world. A great Renaissance is due at the end of the century with the masses of the people participating in the economic and political structure to an extent unknown before in history. Neither Fascism nor Communism, but Democracy, will prevail as a consequence of the revolution. This is a brief account of world history in relation to long climatic cycles, or cycles in the long-term weather trends. The main division points of history are also landmarks in the history of world climate. Old civilizations collapse and new civilizations are born on tides of climatic change. The turning points occur when cold-dry times reach their maximum severity. This happens about every 500 years. The main divisions of history as recorded by the historians—Ancient, Medieval, and Modern—are not just divisions in history. They are also divisions in the long-time weather trends. The last great epoch of the ancient world began in the sixth century B.C. with the decline or Egypt and the older empires of the Middle East on the one hand, and the emergence of Grecian civilization and Persia on the other. 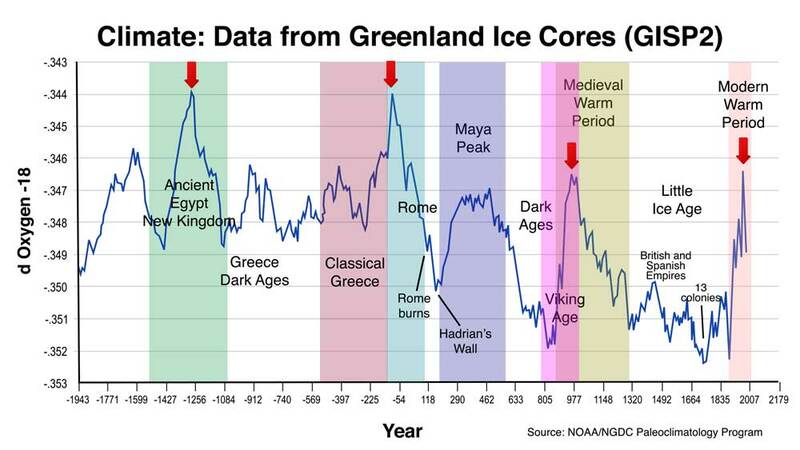 This new epoch of the ancient world came to an end in fifth century A.D., a thousand years later.” (Above is a chart developed from data from the GISP2 ice core project delivered in the early 1990s). The red arrows denote the tops of one thousand year climate cycles (these are temperature highs, identified by the blue line). The red arrow cycle tops also mark the tops of major civilizations. When it is warm and wet, civilizations grown and thrive. When it turns cold and dry, they dissolve and we enter a “dark age.” This is happened over and over again throughout recorded history. “Then came the Middle Ages. This period, too, lasted a thousand years, and came to an end in the 15th century, when the modern world began, ushered in by the Renaissance and the Reformation. A thousand years would bring us to the 25th century A.D., 500 years from now. Various lines of evidence, to be published elsewhere, show how the sixth century B.C. and the fifth century A.D. centered on unusually cold and dry times. Both were centuries of widespread migrations; both were periods of low lake levels and slow tree growth. The 15th century also centered in unusually cold and dry times. All three, the sixth B.C., the fifth, and 15th centuries A.D. witnessed profound social upheavals throughout the whole world of humanity. All three were characterized by the same process—the dying of all old world and the birth of a new one. In the center of each 1,000 year cycle there seems to have been a much warmer period in history, the first reaching a climax at the time of Julius and Augustus Caesar, the second around 900 and 1000 A.D. During the second of these warmer periods, Greenland and Iceland were colonized. Once the warm phase had run its course, the cold phase of the long cycle was on its way. Greenland froze up and has remained so ever since. Many times in the 14th and 15th centuries the Baltic Sea froze over between Germany and Sweden, allowing people and horses to cross from one country to the other on the ice. It is evident at the present time that the earth has been getting much warmer again. The frozen northlands have been receding, along with glaciers, over the world. Animals frozen in their tracks by just such a blizzard as struck the mountain states two years ago, but when so much snow fell that it never thereafter melted until now, have in recent decades been exposed, sometimes with their flesh still edible. It is not difficult to understand why this is happening as the world is approaching again the heat climax of a 1000-year cycle. In fact, if this is true there is reason for believing that around 2040, perhaps a little earlier, perhaps a little later, a heat climax will occur that will exceed our recent one of the 1930s. This might well be the climax of the current 1000-year cycle. After that, glaciers will start advancing again and the world’s temperatures will fall, gradually, until a cold climax is reached around 2500 A.D. Then the modern world will again experience an upheaval as complete as that which terminated the Middle Ages and inaugurated the Modern World. However, both climatically and culturally, secondary climaxes of cold temperatures and devastating droughts, with great waves of migrations and immigrations, accompanied by drastic revolutions in society, have occurred at the end of each intervening 500-year period. In other words, there is a 500-year climate and culture cycle as well as a 1000·year cycle. Every other termination of the 500-year cycle has coincided with the termination of the 1000-year one, but every alternate 500-year cycle has terminated in the middle of the 1,000-year rhythm during its warm phase. However, there has always been a complication. The 500-year cycle breaks down into shorter periods that last, on the average, about 100·years in length. These are clear-cut cycles each having a major warm phase and a major cold phase, two major wet periods, and two major dry periods. One major wet period occurs at the beginning of the warm phase, the other at the beginning of the cold phase. One major dry period occurs at the end of the warm phase, and one occurs at the end of the cold phase. Each fifth cold phase is an unusually severe one as was true in the fifth century B.C., the first century A.D., the fifth century, the tenth century, and the 15th century. All the signs point to a continued repetition of the rhythm. The rest of this century is due to average severely cold. We are at the present moment beginning the cold phase of the 100·year cycle and the fifth and severest cold phase of the 500-year cycle. This will temporarily check (it is starting to do so now) the rising of world temperatures on the 1000-year cycle, popularized so much in recent literature. We said that the 500-year period was a cultural as well as a climatic cycle. Half of the terminations of this cycle have already been accounted for by the 1000-year cycle. What of the other terminations? The first 500-year cycle of history terminated at the time Christ was born. Until 70 A.D. much of the first century was cold. Rome had just passed her cultural prime. The great empire that had taken 500 years to build now sank lower and lower for the next 500 years until it collapsed altogether. The scene of initiative in the world shifted from the West to the East. A Dark Age ensued in most of the West. Turkish peoples, Tartars, and Huns built one large empire after another in Asia. In the West, Christianity inspired one of the most profound cultural revolutions in all history. And so it was that both in the East and in the West a new world replaced the old one. This new world came to an end in the fifth century. The first half of the medieval period, the fifth to the tenth centuries, belonged to Europe. Asia declined in political but not in cultural initiative. In the West came Justinian and the great Byzantine Empire, together with an upsurge of Arabian civilization, which soon marched across North Africa into Spain. At the time this outburst of energy was occurring, China and Japan went through an important cultural renaissance. Then came Charlemagne In the West and the Golden Age of Bagdad in the East. This finished the first half of the Middle Ages. The close of the 500-year cycle saw all of these civilizations fall into decline, to be replaced in Europe by the feudal principality, which was the beginning of the modern state with its economic and cultural development based on nationalism. It was during this dying of an old world and the birth of a new one that the European countries—England, Scotland, Denmark, Norway, Sweden, Russia, France, Germany—were born. This was indeed a great revolution in society political, economic, and cultural. It occurred as one 500-year cycle finished in a severely cold period, and another began. However, the greatest initiative during the 500 year period from the tenth to the 15th centuries, was again taken by Asia. Witness the unparalleled empires of the Khans and the emergence of the Seljuk Turks, then in the late 14th century, Tamerlane. Great storms, followed by bitter cold, devastated Asia in the ninth and tenth centuries, and also drove hordes of Normans out of the northern Scandinavian countries until they had overrun Europe, even to southern Italy, and had conquered England. This was at the termination of the 500-year cycle. We’re at another major turning point after a long period of rising temperatures. They have already began falling again. Some astrophysicists belief we’re entering a mini ice-age. In any event, it’s getting colder and will eventually also turn dryer. We’re seeing the start of a change in the world-wide power base, which should move from West to East (from the United States to perhaps Russia or China. These major changes are highly predictable and happen on a regular schedule as dictated by our Sun and solar system. If you want to know the future, study the past. Thanks! You can’t proof your own copy — proven once again! Valid, relevant, topical, current knowledge necessary for those who would survive impending Earth changes. I read, and am about to reread, Three Hundred Years of Lies! Could have been 1,000 years. I love it when someone fills in the blanks. There is only so many hours to spend reading in a day. It is really nice to have a synopsis or two, or three.